The Coyotes split their double-header series after facing off with the Call State Dominguez Hill Toros at Softball Park last Monday. The Coyotes had a one-two-punch from Nicole Nobbe and Tiffany McIntosh, who proved to be too much for the Toros in the second game with huge hitting in the double-header. Nobbe had a fabulous day, batting 3-for-4 in the series with three doubles, which proved to be a key factor for the Coyote’s scoring. McIntosh was clutch, crushing the ball twice for home runs,adding to her lead in HRs with nine. In the first game of the double-header, the Coyotes let one get away as the Toros were able to rally back with six runs all in the seventh inning. The Coyotes were off to a good start in the first game by scoring first in the third inning, but the Toros would come back in the fourth and fifth inning with two home runs to take the lead 2-1. In the bottom of the fifth inning the Coyotes were down 2-1. McIntosh hit a double to center field allowing Darian Manuz to score and tie the game. Victoria Lievanos would come to the plate and slam the ball out to left center field for the home run to take the lead at 4-2. The Coyotes held up strong defensively until the top of the seventh, but the Toros would rally as they drove in six runs with five hits to take the lead at 8-4. The Coyotes would get one more opportunity to win the game, but only managed to score one run and lost the opener 8-5. Game two of the double-header was a mirror image of game one, but in favor of the Coyotes, as took the game 8-5 over the Toros. The Toros came out swinging in the second game with a two run homer to left field putting them on the board first. The Coyotes would answer back with a double from Nobbe, followed by a two run home run from McIntosh to center field to tie the game. In the bottom of the third inning, the Coyotes would make a push with a double by Nobbe, single from Lievanos, and another single from Alyssa Ramos, giving the Coyotes the advantage up 5-3. The Coyote’s Nobbe and McIntosh would continue their hard hitting in the bottom of the fourth, as Nobbe hit a double to right center field setting up the scoring run. With two outs and the runner on second base, McIntosh homered to right field giving the Coyotes a comfortable 7-3 lead. In the bottom of the fifth, the Coyotes were not done continued their streak as Mary Menicucci tripled down right field. Ramos would drive Menicucci in on a single to increase the Coyotes lead to 8-3. The Toros tried climbing back by scoring two more runs, but the pitching and defense of Coyotes would prove to be to much giving the Coyotes the win. 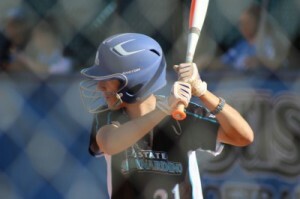 The Coyotes softball team improved to an 11-8 record and the season is in full swing.